Hotels near Capitol Reef Adventure Company... Adventure Guides! Treat yourself at this beautiful Lodge! This historic lodge is located close to Capital Reef Park and is a perfect oasis after a long day of hiking and exploring. The lodge is lovely and well kept with historic photos and artifacts. Every room has its own theme; each cozy and comfortable. Super comfortable bed! The great room is perfect for lounging as are the front and side patio areas. The hot tub in the middle of the back lawn is spectacular for night sky gazing. Breakfasts are delicious but not included. The family that owns/runs the lodge is friendly, accommodating, helpful in every way. We loved this place. Room tip: Rear facing mountain best. 1st advantage of ext. door & small patio. Front view of fields & bison but some road noise. Reading reviews about service was a little scary but we did not experience poor service so perhaps there have been significant changes from ten years ago. This place is beautiful juxtaposed against the towering rock cliffs and has a small herd of bison roaming in the front yard. The rooms are smallish but so are the far more expensive lodges in Yellowstone or Yosemite to name a couple. Concur with the comments about sound transmission between the rooms and perhaps some thick rugs could help reduce it. Just be forewarned. Breakfast was very good and $20 for farm eggs and bacon for two is not expensive. Staff was very accommodating. Charlene took care of all our requests including refrigerating our wine and beer. As a further suggestion, it would be wonderful if there was a Keurig coffee maker available for guests in the dining room - 24 hours a day. 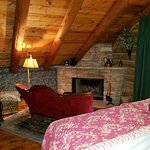 We spent two pleasant nights at the Lodge at Red River Ranch in Autumn, a second floor room. 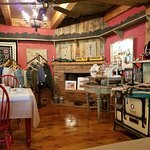 The room was clean, comfortable and charming with an atmospheric Old West decor. Although the room was a bit dark, it was a well air conditioned respite from the outdoor heat.The onsite restaurant offered a delicious breakfast with polite and friendly service.The innkeeper was unobtrusive but available when needed. It felt as if we were staying in a private home rather than a lodge. I most enjoyed sitting outside with a morning coffee watching hummingbirds fly and bison graze against the spectacular red rock background. Room tip: The upper floor balconies are very small. They are useful for stepping out to take in the view, but not for sitting. We loved our recent stay here. The room was quaint and charming and well appointed. It is set in beautiful open countryside and was very peaceful. While breakfast is served on site, we missed not being able to have dinner or a drink here, needing to drive into Torrey for this. It was a quiet stay with not much interaction with other guests or the family who own/run the lodge. Just what a lodge should be and more! 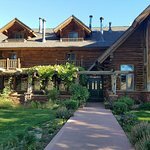 We loved our stay at the Lodge at Red River Ranch. 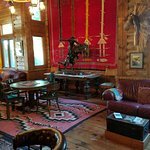 This is not a lodge like those at Bryce Canyon or Zion NPs - this is a real lodge. Each room is unique. It's family run. Has loads of character. Board games are available and more. There are a couple of outdoor cats (Mazie and Benji) to greet you (well Mazie hangs out more than Benji), but they both came with us when we went for an evening hike below the cliffs on the property. The breakfast was laid back and very tasty, favorites included the french toast and blue berry pancakes. There was A/C but we didn't need it at night, just open the windows and let nature do its thing. It really was a great way to sleep. Also don't miss the stars - living on the east coast of the US really has too much light pollution to see anything like what you can see here. We wish we could have seen more of them but we kept exhausting ourselves in Capital Reef. We visited in the summer (July), I'd recommend early hikes with a leisurely afternoon to avoid the heat, then go back out after dinner or in the late afternoon for round two if you want.